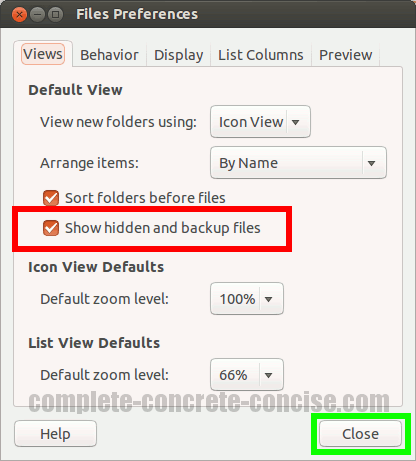 This tutorial is for Ubuntu 13.04 running the Unity Desktop and using the Nautilus file manager – this is the default configuration for Ubuntu 13.04. The instructions may be the same or similar for other versions but no guarantee is made. Note: for some reason, Nautilus has changed quite drastically in Ubuntu 13.04 from previous versions. 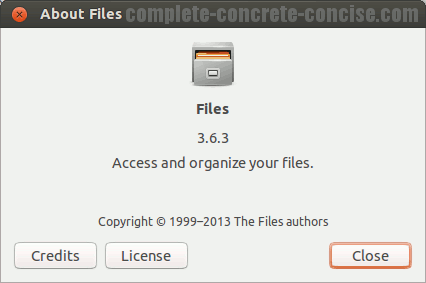 Not sure, yet, if this is heavy Ubuntu customization or changes in Nautilus itself. On significant (minor?) change is that in the About dialog, it is now called Files – never mind that it shows up as nautilus in the process viewer. 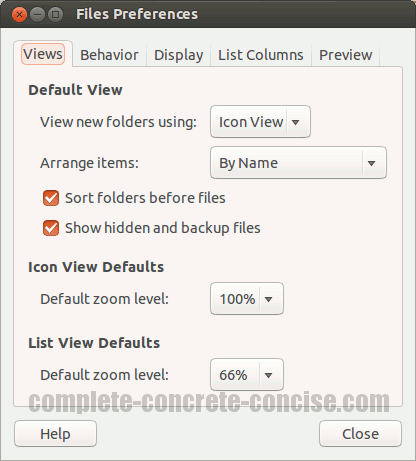 Note: you can press the Enter key as soon as Preferences is the topmost displayed option. You can also select Preferences by clicking on it with your mouse, or navigating to it using the keyboard arrow keys and pressing Enter. 6) Restart the Files application to enable the setting. I think this is a bug because I would expect the changes to take place immediately after closing the Preferences dialog.